At flipkart.com you can purchase Pedigree Adult Meat Rice Dog Food(3 kg) for only Rs. 493, which is 3% less than the cost in Snapdeal (Rs. 510). 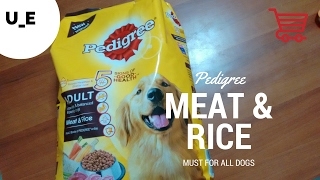 The lowest price of Pedigree (Adult - Dog Food) Meat & Rice, 3 kg Pack was obtained on April 24, 2019 9:46 pm. PEDIGREE Meat & Rice is a healthy and complete meal for your adult dog, packed with proteins (from meat) & vitamins (from vegetables). My dog Duke loves this product.